Image © Comic-Con International and DC Entertainment. 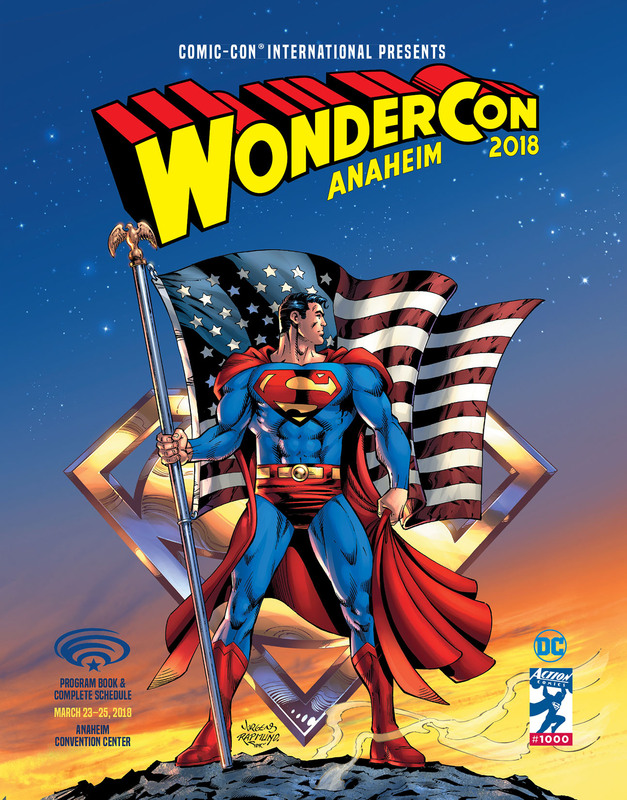 The program book cover for this year’s Wonder-Con has just been released, and it has a logo I designed in the style of the Superman logo. I had worked with Director of Print and Digital Media Gary Sassaman on the logo for last year’s Comic-Con International program book, and we both enjoyed the process, so I was happy to be asked to do this one. I’ve worked on many logos based on the classic Superman logo. The one above is the Ira Schnapp version from 1940, based on several earlier ones created by Joe Shuster. The current version by the Milton Glaser Studio first saw print in 1983, and is the one I used as my model. The perspective of the Superman logo is the most complex I’ve ever worked on. Above are some diagrams of one, two and three-point perspective drawn by me. 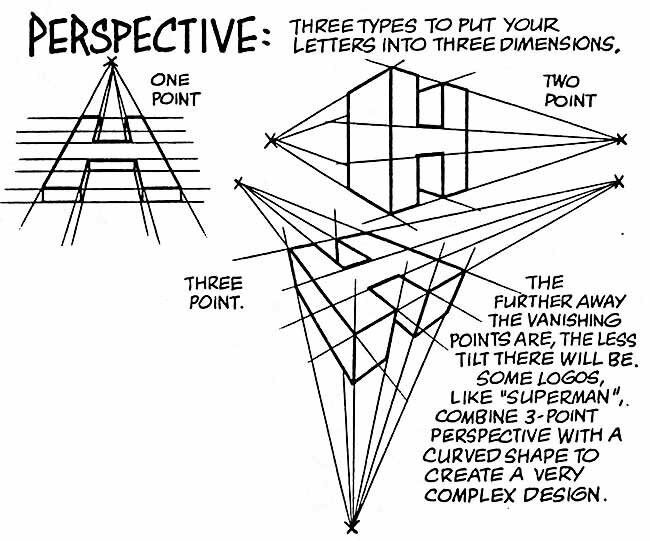 Superman’s logo definitely has more than one vanishing point, and because you can see three sides of the letters rather than only two, it must be classified as three-point perspective, but it’s more complicated than that. The perspective on the telescoping (the extension that gives it depth) clearly recedes toward a distant vanishing point at the upper left. The fronts of the letters recede toward the right: the U is closer than the N, but because of the curved shape it’s hard to estimate exactly what that angle is. I’ve drawn likely perspective lines heading toward a distant vanishing point on the right. We can see three sides of the letters, but the vertical sides are parallel rather than angled toward the bottom as you might expect, so the third vanishing point does not really exist, or is impossibly far away toward the bottom. 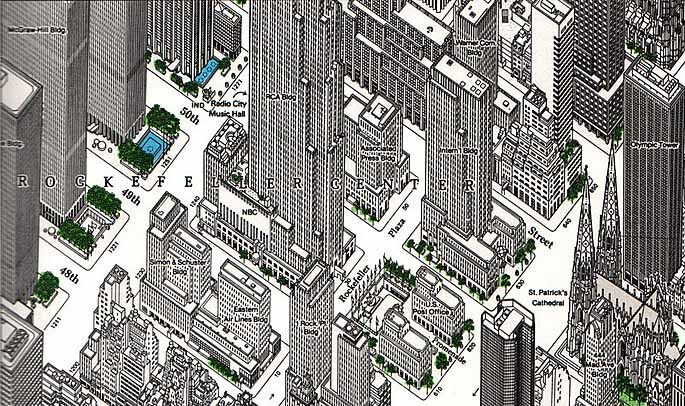 There’s another kind of view that shows three sides of a cube called Isometric Projection, usually used for small things like parts diagrams, but also used in maps, like this one of Rockefeller Center in Manhattan. This view uses no perspective at all, everything is the same distance away. The lack of a vertical vanishing point in the Superman logo is akin to this, but otherwise not similar. So, how to mimic that complex perspective? I find the best way is to put a large printed version of the Superman logo on my drawing board and create a new logo over it on translucent vellum, first drawing out the fronts of the letters in pencil. For WonderCon, some of the letters were the same as Superman: the N, E and R. The rest had to be interpreted in the same style. Once that was done and okayed by Gary, I used the same method to draw the telescoping and tagline, with the telescoping on SUPERMAN as my guide. Now is when it really starts to look like the Superman logo! Fortunately the sides and insides of the letters are in shadow, so that saves some time. Only the tops and front are open for color. 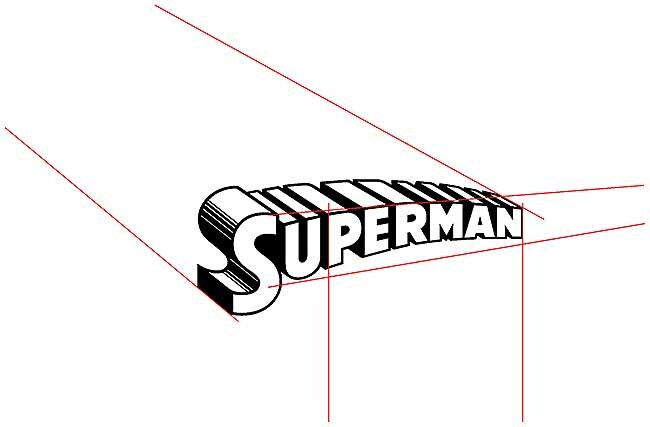 The graduated shading lines from the S in Superman were only needed for the C in Con, and a little on the first O. The pencil sketch was then scanned (in two parts, too big for my scanner to do it in one), the parts combined, and placed in Adobe Illustrator, where I created the vector logo by drawing on top of the sketch, correcting any small flaws as I went. For instance, I wasn’t happy with the shape and size of the O in WONDER, so adjusted that in the Ilustrator version. The W now seems to lean slightly to the left. I didn’t notice that before, or I would have tried to correct it! Finally I added red and yellow in the two “faces” of the letters in a classic Superman plan. Gary wondered if I should make the tagline, Anaheim 2018, similarly outlined and with telescoping, but I thought it would make it too complicated and hard to read, so said we shouldn’t, and Gary concurred. I’m happy to see the final program book cover, and I think it looks great. Hope you’ve enjoyed this look at the logo’s creation. Many others can be found on the LOGO LINKS page of my blog, and in the “Pulled From My Files” sidebar topic on the blog’s home page. This entry was posted in Logo Studies on February 15, 2018 by Todd. Nice article. Are you going to be at WonderCon this year?